My love of Black IPAs seems slightly weird to me — in the world of regular IPAs, I tend to like the ones with the lightest grain bills, and a minimum of malty sweetness intruding into my hop bouquet. Yet I love Black IPAs — screw all the stuff in the middle. 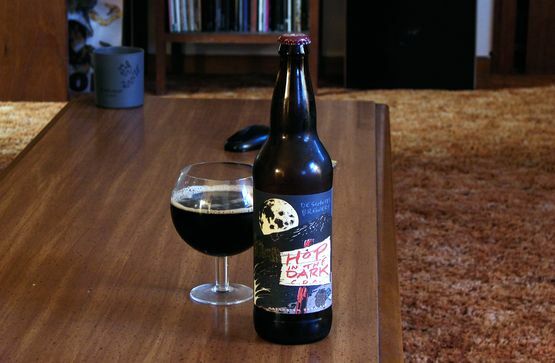 Hop in the Dark calls itself a "Cascadian Dark Ale," which is a totally made-up and confusing term that northwest breweries need to stop using (I don't care if 'Black IPA' is contradictory; it's not confusing.) But you could make the argument that this is a particularly hoppy porter, or stout, too. Whatever it is, it's delicious. I suppose what Black IPAs offer (that overly-malty regular IPAs do not) is added complexity without too much cumbersome sweetness. Let's take Hop In the Dark, since I am in fact reviewing it. You could point out some sweetness from those dark malts, but it's not rich, and arrives side-by-side with a dry, bitter coffee-ish flavor from those same dark malts. It's like the hint of sweetness you get in a dark chocolate, more of a suggestion than a sensation. Hop In the Dark has all the complexity of a stout, without the body, and with the nose and hoppiness of an IPA riding on top. The hops are both fruity and dank, heavy on the pine, with a thick rich mouthfeel that suggests dark chocolate, cherries, and dried fruit. The finish is somehow both rich and dry, sweet, hoppy, and clean all at the same time, a beautiful spiral of flavor that captures why I love this style. More than perhaps any other style, a good black IPA manages to be two things at once, melded perfectly, and perfectly complimentary. I suppose it stands to reason that piney American hops would go so well with dark malts, but it's nice finding a beer that reminds you of this with exceptional tastiness. The hops chosen here are the perfect hops for a dark grainbill; the dark grainbill chosen here is the perfect balance of roasty, sweet and clean. Considering I picked this up entirely based on Deschutes' reputation and the coolness of the label art, I sure did get lucky. This is some of the best six bucks I'll ever spend on a vacation. Availability: 22 oz bomber. Seasonal release, May to September. Thanks for the kind words, IPA. I can definitely understand naming it out of pride. It's one of those things, I guess, where if the "CDA" name had caught on, people would know what it meant, and it would make just as much sense as India Pale Ale made when it was first coined. I always appreciate a good bear story!